Let's stop this laughable horseshit about the "starving" Venezuelans. Particularly when the "starving" people are pictured shopping at WalMart. FFS, look at the climate - - get a few packets of seeds and within a few months you'll have more than enough food in your backyard. You're not starving until you have to resort to cannibalism. That might work if you got time to guard those seedlings from theft 24-7. --and superior numbers to avoid being over run by mobs for them. I figure they would rather be out scavenging than watching growing seedlings that will inevitably be stolen from them. How many WalMart shoppers do you suppose could identify a potato plant? Look at the shelves in that Walmart. Empty. And those few packets of seeds, if you can get them, take months to grow and produce vegetables. And just vegetables, not beef or pork. And you measure starvation by the number of cannibals in society? I don’t want to live in your socialist neighborhood, Mr. Rogers. I don’t know if you are a socialist, but all socialists are deluded nut jobs. Have you not read the accounts of Venezuelan farmers inundated with hordes of city folk descending on their fields and pastures looting crops and slaughtering animals right in the fields and carrying off the parts? You also have understand human nature, desperate and jealous neighbors may not know what you are growing but destroy whatever you have because if they have nothing everyone else better have nothing. And they'll know who to rob because it will be those guys who are not emaciated skeletons with a dead look in their eyes. ... And be sure to wear over sized pants so it looks like you lost a lot of weight. That's correct - - laughable horseshit is precisely the term to describe these stories about "starving Venezuelans". Snowflakes around the world are aghast that one section of shelving is mostly empty in that WalMart picture. Let's ignore the fact that the section behind it is full of stock. As is the aisle at the end of the shelves. Educate yourself my friend, and start with the Holodomor. Take a good look at pictures of the Ukrainians who were actually starving to death and let me know how they compare to that Venezuelan WalMart shopper. Meanwhile, A51, I’m seeing interviews of Venezuelan citizens who’ve made it into the US and have experienced the crisis back home or have relatives living through it telling us that Venezuela is a hell hole right now. They tell us that people are eating out of garbage cans and cooking dogs, cats, pigeons and zoo animals to survive. But I guess we should ignore those first and second hand accounts because leftists in universities and media tell us to? And the holodomor was a completely different animal. A forced starvation is different than a socio-economic crisis where food and other commodities are in short supply. Hey, let’s have some of that here. And the holodomor was a completely different animal. A forced starvation is different than a socio-economic crisis where food and other commodities are in short supply. Thank you for reiterating what I've been explaining to you. 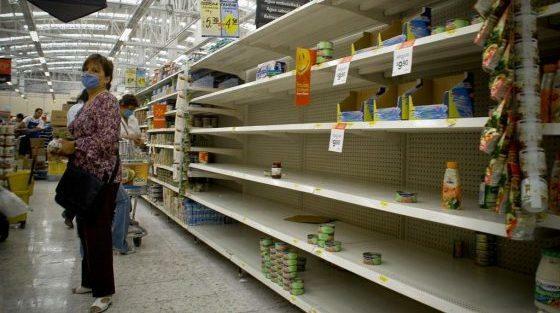 A few empty shelves in WalMart doesn't quite equate to the catastrophic Holodomor. That was a legit starvation and claimed MILLIONS of victims. How many people have died from starvation in Venezuela? Dozens? Hundreds?